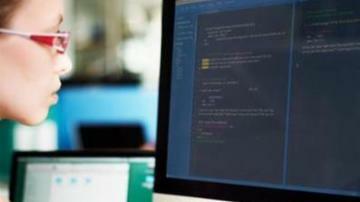 Active Server Pages (ASP) is Microsoft’s first server-side engine for dynamic web pages. ASP’s support of the Component Object Model (COM) enables it to access and use compiled libraries such as DLLs. It has been superseded by ASP.NET, but will be supported by Internet Information Services (IIS) through at least 2022. An alternative is to issue a new and unique token at each log in. 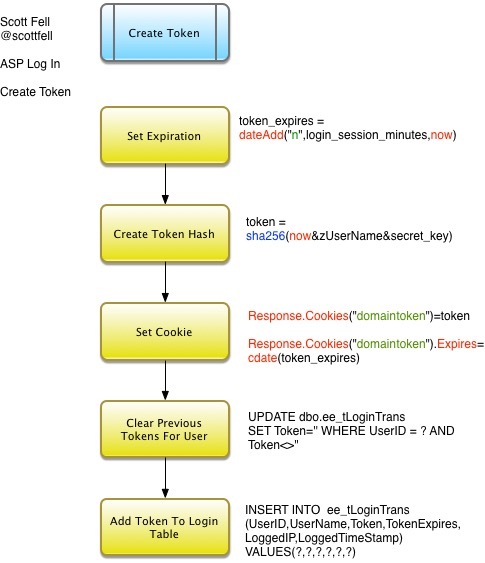 Then set a cookie using the generated token as well as storing the token in a user table in your database. 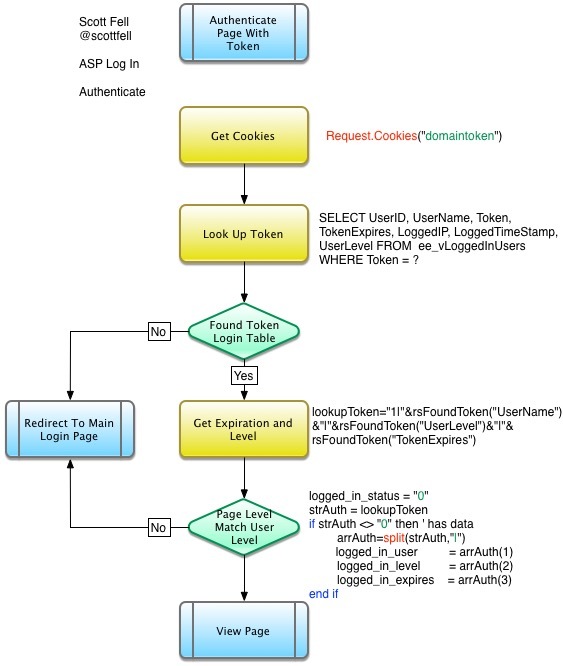 On each page load, look up the cookie with the token, and look for a match in the user login table. If a match is found, test if the expiration date is valid. When everything checks out, give access to the page. I have created a more detailed sample using this process that also allows for user levels. This demonstration is intended to show the process and is not meant to be a production-ready login system. I am using MSSQL SERVER 2012 with two tables and one view. The first table is a users table where I am storing the user's name, email, hashed password and user level. The second table is the login transaction table where I store the tokens with a user id, the token expiration, the IP used to log in and and the timestamp of the log in. I have the field LoggedTimeStamp set to the current date/time using getdate(). The view of logged in users selects rows of data from the Log In Trans table where the TokenExpires is greater than the current timestamp and the token field is not blank. A side benefit of using a log in transaction table like this is you can run a report of who logged in with the time stamp and IP. You can also view the current list of logged in users and if you like, remove their token and thus logging them out. 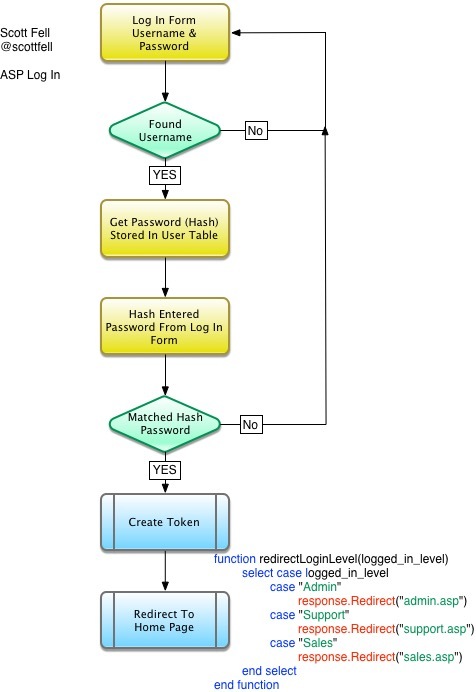 The three flow charts below shows the process of logging in, creating the token and testing authentication on each page. The file structure I am using in this demo uses an includes folder where I have a config.asp, functions.asp and nav.asp. The config.asp is used to store my database connection and other variables such as the amount of time to be logged in and a secret key used in the hashing functions. The Functions.asp is used to store functions I will use on multiple pages such as sha256, setting passwords, setting the token, looking up the token. The nav.asp are the navigation links. The first step is to create the two tables and view. Make sure the LoggedTimeStamp field in the ee_tLoginTrans table will default to the current date/time. You will have to make some adjustments in your code. For my own testing, I have placed the files in a sub folder of one of my domains and you may see code to include a file like . It is important you adjust the path to where you actually store the files. If your includes folder is at the top level of the site, then change to . Note that I could have simply used but purposely didn't. In order to use that method, you would need to have parent paths turned on in IIS and that is a security risk. I see a lot of videos and tutorials demonstrating how to turn parent paths off because it is easier to migrate your old code, but don't do this. cmd.CommandText = "SELECT ID, UserName,UserLevel, Password FROM dbo.ee_tUsers WHERE Username = ?" I received an automatic e-mail when this article was "activated". Now I realize I have never come back to give a feedback... I am sorry! I implemented your great ideas many many years ago and the token is still being used on a daily basis! It never gave ANY trouble. NEVER! P.S. ; I am glad sadrobotx could solve the problem! Classic ASP was launched by Microsoft in 1998 and dynamically generate web pages upon user interaction and server-side processing; this model is complementary to serving static web pages like well-known ".htm" files which mainly have fixed content, and opens a whole new world of possibilities in the web area. The ASP page have a mixed content of HTML and server-side VBScript (all in a single file). Microsoft included ASP technology in every Windows version, from Windows 2000 to the latest. However, on newer versions of server operating systems, classic ASP is blocked by default (but this can be changed by server administrator). By default, ASP pages have ".asp" extension and are using VBScript (which is a restricted and "light" version of Visual Basic programming language). ASP.NET is the successor of classic ASP and implements a completely new model. Released in January 2002, this technology is actively supported by Microsoft in every Windows version starting with Windows XP and server-editions. The new ASP.NET web pages have an ".aspx" extension. 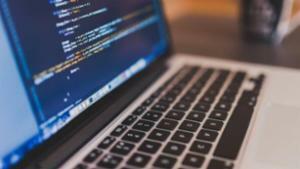 The dynamic program code is stored separately (using the code-behind model) in another file with an extension of .vb (Visual Basic) or .cs (C sharp), depending of the programming language used. I use all of the above depending on the needs of the client and implementation. While the nuts and bolts can be compared ad nauseam, the issue is simple. If you have security concerns PII/Hipaa/financials you have to be on windows platforms with AD. If your presentation requires controls that need to be valid against data changing outside the scope of the client. you have to use some form of server-side controls. NET does this very well. Scripting Language sites will out-scale managed code every time, because resources are only consumed as needed. I have had 1500+ concurrent users against a 4 core server on classic asp including the SQL Server instance and never reached 30% CPU. Lamp solutions just don't have the toolsets for monitoring and performance metrics to bother with comparing them. Have you ever needed to get an ASP script to wait for a while? I have, just to let something else happen. Or in my case, to allow other stuff to happen while I was murdering my MySQL database with an update. This was written to stop an update script from using all of the CPU itself. It was slowing down all of the other services on the server, as it took 20 minutes or more to run. In my case, I was updating a MySQL database with 45000+ lines, from a CSV file, with far too many columns. There was a lot of processing for each record, and the data had to be checked "backwards and forwards". As anyone who has tried to run one of these will tell you, it just sends the CPU to 100%. And hopefully, you can see why. The server is trying very hard to get to the end of the script, burning clock cycle after clock cycle. Another variation of this is to use the ASP "Timer". This basically has the same effect. as you don't need to use Exec, as the output does not need capturing. To start, I want to make sure everyone understands the importance of utilizing parameterized queries. They are useful in preventing SQL Injection, and reducing the size of as well as reducing the size of the system table, syscacheobjects. In my mind there is no more efficient method to programming and development than organizing your code into re-usable chunks. Any time you can re-use something you have already developed, should be placed in an include file and called when the chunk of code is needed. Thus said, I had a need to make some serious database calls and as everyone knows, simply cleaning the input is not always the most efficient and effective method. It is always better to force the data types of the parameters you are passing to the database. It is pretty easy to use parameterized queries in code to do this, but why bother writing and re-writing basically the same code every time you need to use it. So, I came up with a method that will do everything you will need it to do for dynamically parameterized queries when developing a classic ASP web application. I also added in some recordset paging. Please note this can also be ported to Visual Basic and complied into a COM object for even more efficiency. Please see the code below for the usage and class files for this tip. Casting as nvarchar, yes it does double the string, but it also makes it so the code can be used internationally, and keep special characters. If you are going against MSSQL Server, you should always use stored procedures rather than dynamic SQL, Regardless of Injection issues and data type performance. You are missing out on internal caching and encapsulation. Now, I run ASP Classic Applications mostly, about 99% of my site scripts are ASP Classic, with just a touch of VB.NET (ASP.NET). So, to test my sites within Windows 7 while I am there, I installed IIS7.5 and setup Classic ASP to run on the windows 7 system, and here you go, the instructions on just how it is done. Note: Total time to setup is about 3-5 minutes, depending on the speed of your system, and you will need the windows 7 CD. Great article, I recently did the same (unfort. I didn't read this first!). In my previous IIS7 on Vista, everytime I add a new site for dev, I added it in IIS7 with a unique port number, browsing to the folder of the website etc. So with localhost being my landing page, a new stie would be anything like http://localhost:569. Sometimes port numbers weren't like in Chrome and FF (IE never had the problem) saying it was reserved for elsewhere. Is this the best way of setting up multiple sites on IIS for development or is there a more straighforward way? I have over 100 to set up shortly and manually adding them one-by-one will be a pain. Do you know if it's impossible to export the list from my IIS7 and import it to IIS7.5? Maybe you have a better idea for all of this? i went to a lot of hassle to lookup my account from 8 years ago to say THANKS. Now im going to go to a little more to hit the yes this was helpful button on another computer because the browser on my windows 2008 isnt configured for security and i cant remember how. i hate how MS changes isht with every release because they want to make us feel dumb so we keep de-upgrading. i want to upgrade to windows 98, I imagine how fast the required specs for their power hungry products would tear through that. Knowledge is the Power that you have to help others in need of your help. The information below is for people that want to learn how to use Parameterized Queries in their Classic ASP scripts. I was forced to learn this back in the beginning of 2009 and have taken off with it. There is nothing really tough about it, just read the liner notes and then try it out for yourself. In this tutorial below, I am giving you several different scenarios and the code for them. It works all out at the end. 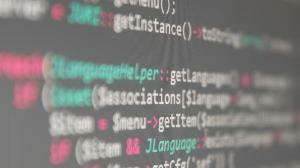 Parameterized queries are queries that have one or more embedded parameters in the SQL statement. This method of embedding parameters into a SQL statement is less prone to errors than the method of dynamically building up a SQL string. Make sure that you are using the charset=utf-8, if not then you will lose some of your protection! First, we need to make sure that no one can attack our codes, so we are going to use my custom ProtectSQL script. This will be used to PROTECT your code/database from being attacked by idiots with nothing better to do.
' replace vblf with <br /> (This is mainly used for Memo fields). These are our Variables for our Parameters. For ALL Examples, as you can see, we have wrapped the ProtectSQL() around each one, so that we can capture ALL the bad things that someone might want to throw at us. chEmail.commandtext="SELECT cusEmail, password, mydate FROM ordercavecustomer WHERE cusEmail =?" As you can tell, we are not adding in a number, this is because the INT does not require a length, it can be any length up to 1 billion. chEmail.commandtext="SELECT cusEmail, password, myID FROM ordercavecustomer WHERE myID =?" Let's get these from our QueryString. As you can see, we have the Parameters in order of the way they are listed in our Statement, if not, then it will give you an error. chEmail.commandtext="SELECT cusEmail, password, myID FROM ordercavecustomer WHERE myID =? and cusEmail=?" Once again, we have to have everything in order, to make sure that it gets inserted correctly and without error. chEmail.commandtext="INSERT into ordercavecustomer(cusEmail, password, myID)values(?,?,?)" Same as before, in order as they are written. The WHERE goes last, and as you can see, it is also last in the parameters list. chEmail.commandtext="update ordercavecustomer set cusEmail=?, password=? where myID=?" chEmail.commandtext="delete from ordercavecustomer where myID=?" 7. Display the information to the visitor with the ReverseSQL in place. chEmail.commandtext="SELECT cusEmail, password, username, mydate, fname, lname FROM ordercavecustomer WHERE cusEmail =?" response.Write "Sorry, the user does not exist in our system, Sorry! Please try again later." The copy/paste version is below. I want to apologize to "Slim81" and everyone else that has come in here and had issues with this Article, and that code that I supplied. It was a complete over-site on my part, to have not caught on to the Parameter names, before I posted the Article. Thank you to: rrhandle8 , for bringing it to my attention in a Thread I was assisting him with. Sometimes it takes a set of fresh eyes, to catch something that we all may miss in life. Take Care and once again, please forgive me for my lack of attention in posting this article. First off, great post! This was tremendously helpful for me. Super trivial, but I thought I should share. I recently decide that I needed a way to make my pages scream on the net. While searching around how I can accomplish this I stumbled across a great article that stated "minimize the server requests." Although, it does not seem that the compression of the CSS and JS files has made a too much of a difference in file size of the requested items, as you can see from the load times of both pages are significantly differing suggesting that combining the files in such a way has reduced the round trips to the server. Not only the load time of the page, but also the load time of the w3svc process on the server. I watched the process for these 2 requests and noticed the compressed page had half the load time on the CPU. At this time I do not believe the compressed/combined files are cacheable (unless I can be proven wrong of course...). The files are opened from the server utilizing the FileSystemObject, read through, and then combined to a single string where it is rendered. Valuable info . I may use this in future .